HUNTINGTON BEACH, Calif. -- Great white sharks swam among paddle boarders at Sunset Beach and a GoPro camera was there to catch it. The two paddle boarders went to see the sharks at about 7:45 a.m. Friday, knowing they were in the water, said Courtney Hemerick, who captured the the footage. In the video, Hemerick says, "There he is," and then points to two sharks swimming below. The camera is periodically placed under water, providing a rare up-close glimpse at the sharks. 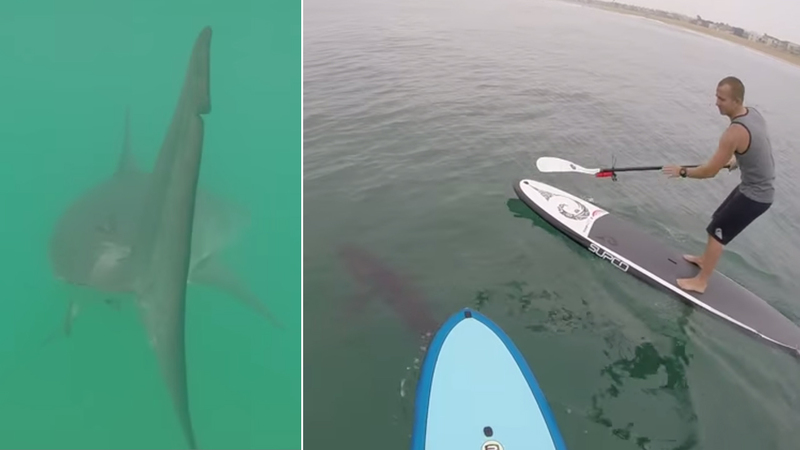 A second man later floats over a shark as his paddle glides across the water. Hemerick said he wanted to see the sharks in their natural habitat.